If you’re a fan of good ol’ classic tomato soup let me offer you something in the way of a roasted tomato soup with garlic croutons. 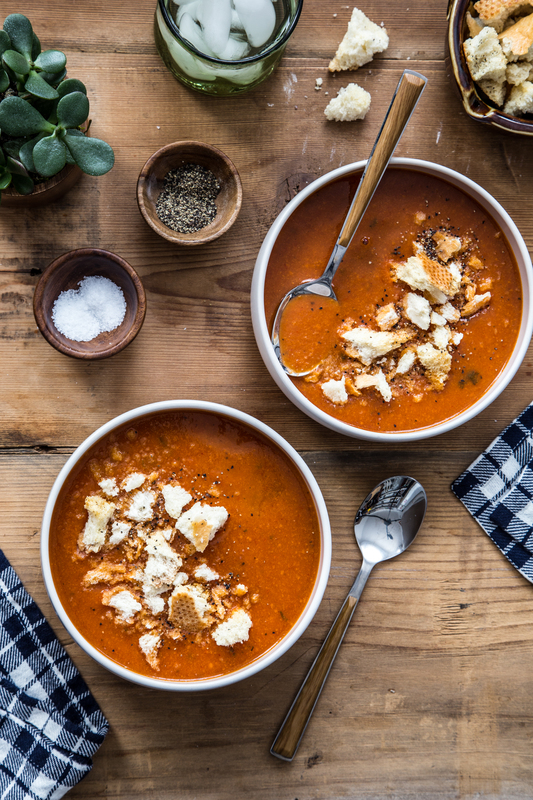 Yes, indeed, making tomato soup at home is so worth the effort! But the truth is, it takes very little effort. We are smack dab in the middle of winter and this time of year is certainly not known for it’s abundance of juicy, sweet tomatoes. In fact, winter tomatoes are usually pretty crappy. But, I have found the trick to making lame winter tomatoes into something lip-smackingly sweet. That’s right, a long, slow roast in the oven turns winter tomatoes into freaking awesome tomatoes. My recipe for slow roasted winter tomatoes is a touch time consuming (almost entirely hands off) but is beyond simple. 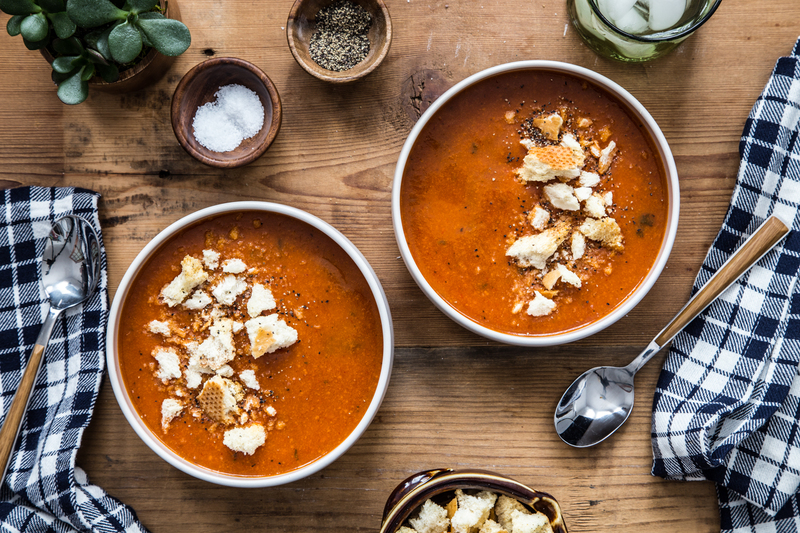 The tomatoes can definitely be eaten on their own, but I encourage you to make a double batch and turn half of them into this cozy roasted tomato soup. Then you can serve it with either a classic grilled cheese sandwich or some quick garlic croutons for a bit of crunch. This roasted tomato soup is my first soup of Soup-er Bowl Week 2017! My friends Melanie and Courtney are going for our third year straight in celebrating the big game our own way: surrounded by bowls of soup. Be sure to check out Melanie’s Meatball Pizza Soup and Courtney’s Creamy Orange Carrot Soup. 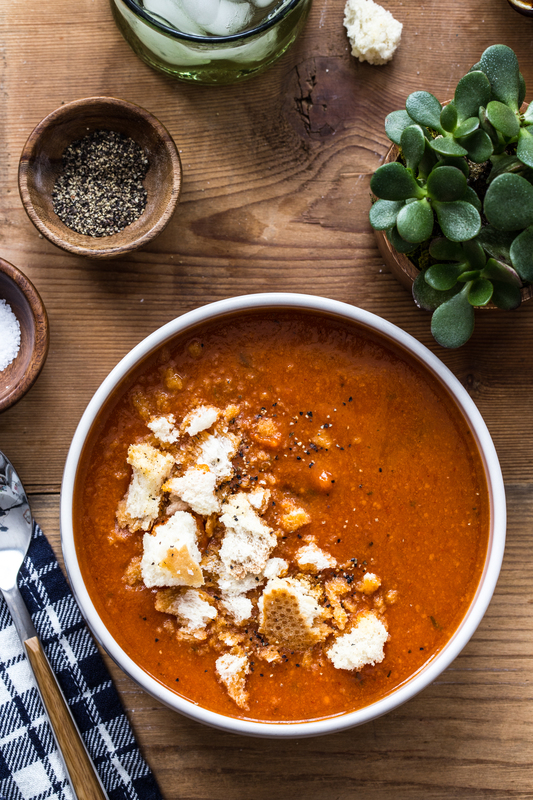 On Thursday we’ll be sharing 3 more awesome soup recipes so stay tuned! Bloody Mary Soup, Slow Cooker Ham and Bean Soup, Slow Cooker Pork Ramen, Homemade Wonton Soup, Slow Cooker Minestrone Soup. This is an updated post and recipe that was originally published in 2013. In a large pot, heat olive oil over medium heat. Add onion, carrots, and celery and cook until beginning to soften, about 5 minutes. Add tomatoes, garlic, broth, basil, salt and pepper. Bring to boil. Reduce heat to a simmer and cook until carrots and celery are tender and flavors have blended, about 15-20 minutes. Remove from heat and allow to cool for about 5 minutes. Use and immersion blender to blend soup to desired consistency. A standard blender can be used and soup can be blended in small batches. Return soup to the pot over low heat and adjust seasonings to taste. Serve soup with croutons and enjoy! Spread bread pieces out onto a rimmed baking sheet. Spray with olive oil spray and sprinkle evenly with garlic powder and salt. Bake for about 15 or until croutons are dried and golden brown. Disclaimer: Thank you to Le Creuset for offering the giveaway! I know just what you mean! Thanks, Loretta! whenever I’ve been to restaurants the tomato soup that they serve is not that thick but yours looks nice and think. I am a sucker for a homemade crouton 🙂 Thanks so much for stopping by and taking the time to comment! Have a great weekend! 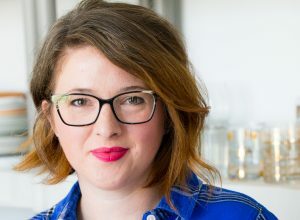 You have no idea how much I am in love with your blog! 🙂 Love this. Perfect soup for a cold and dark January! I couldn’t agree more, Julia! Thanks so much for stopping by! Your pictures are gorgeous and I TOTALLY agree with you about winter tomatoes. I love tomato soup and your soup looks heavenly! I just love that you roasted the tomatoes! Thanks for sharing the recipe. Emily! I love grilled cheese with my tomato soup, but am going to try your croutons. They look so yummy! This looks so incredibly cozy. I made roasted tomato soup years ago, but definitely need to try it again. It’s perfect for this time of year! Love that you topped this hearty soup with croutons – genius, Em! My absolute favorite soup is Autumn Chowder!